Story is synonymous with change. Be it a fist to the face or the most intimate of revelations, a fork in the road or the destruction of a universe, no narrative can exist in stasis. The contemporary myth of the superhero has for many decades accumulated a certain subconscious appeal by inflating this tendency to epic levels. Hercules was born a hero; Beowulf was badass from day one - but the twentieth century demanded more of its fictional saviours. The primal moment of any comic book superhero's journey is an act of transformation. Whether a literal shifting of shape or through the metaphor of an outlandish disguise, these figures offer the possibility of identity as fluid, malleable stuff. Their greatest enemies are often those with the ability to steal away that power of self-change, of self-definition - to rip off the mask, to sap the strength, to bind or freeze or rob them of flight. At a deeper level, the superhero's transformation isn't merely one of self, though. Donning the tights or flipping forms is a shift between realities. Clark Kent and Superman may ostensibly occupy the same city, but their respective worlds are never entirely one and the same. The same goes for Bruce Wayne and Batman, Peter Parker and Spiderman, Diana Prince and Wonderwoman. To fans their adventures suggest that the certainties of our material world aren't as limited as daily life might suggest; that we occupy spaces of possibility, rather than knowledge. It's no surprise that Geelong's Back to Back Theatre would eventually turn to the superhero narrative - the company has long traded in a distinctive style of theatre that explores the electricity generated when multiple realities co-exist on a stage. Back to Back's works enact transformation on aesthetic, thematic and formal levels, and it's rare that an audience member will themselves be left unchanged by the experience. Take small metal objects, the 2005 production that has since toured the globe extensively. In a busy public space - train station concourse, ferry terminal, town square or park - audiences equipped with headsets witness the unfolding of a shady deal gone sour as it plays out among the unsuspecting passers-by. The spectacle of the massed audience watching something invisible to the rest of the world itself becomes a performance, of course. The viewer here is implicitly aware of being viewed. The drama has been freed of a conventional stage, but that freedom means that the reality of the street frequently intrudes on the artificial reality of the story. Food Court(2008) took us back to the theatre - to the proscenium arch, in fact, that most conventional of stages - but maintained the blurring of reality through an ingenious and at times astonishing combination of technological wizardry, haunting projections and swirling lightscapes, a live, improvised score and performances that moved between haunting abstraction and hair-raising honesty. The effect was one of both nightmare and unsettling truth, and it was often unclear how much of what played out was carefully crafted and how much was spontaneous. 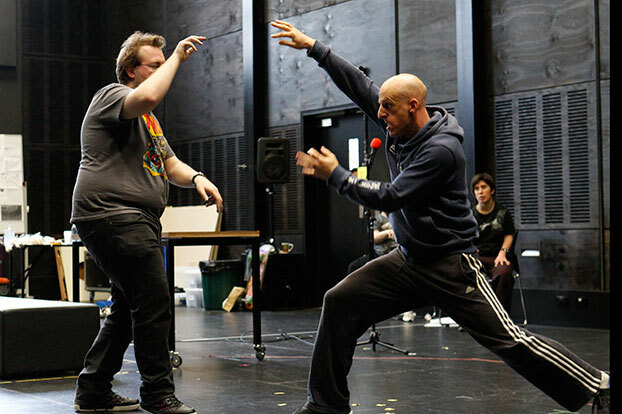 2011's Ganesh Versus the ThirdReichwent even further with this exploration of the protean reality of performance, cross-hatching history, myth, theatre and the reality of the rehearsal room. More than any of Back to Back's previous works, it implicated its own audience in its politics of representation, producing a dynamic between stage and seating bank equally discomfiting and exhilarating. The period across which this suite of works appeared has seen the company itself undergo great transformations. The core ensemble and creative team have stayed relatively stable during this time, but Back to Back has gone from a promising but mostly unknown outfit operating out of a regional centre to one of Australia's most visible and sought-after presences on the world stage. These and other works have played more outside of the country than within it, and the local premiere of a new production by the company has become one of the most exciting announcements in any given year. This is a short extract from a longer essay published in the program for Super Discount, which is available at Box Office and The Bar for $10.